Last week, the company gave the staunchest and most revelatory defence yet of its business model – courtesy of an executive who knows a thing or two about the rigors of taking a large-scale entertainment business public. Barry McCarthy has shunned the media spotlight since being named Spotify’s CFO in summer 2015. He joined Daniel Ek’s company after more than a decade at Netflix, where as CFO he successfully helped CEO Reed Hastings float the company in 2002, before eventually leaving in 2010. On Thursday (March 15) McCarthy took to the stage in New York to present at Spotify’s Investor Day, where the music service officially confirmed it would be going public on the New York Stock Exchange on April 3. His punchy lecture heavily suggested that Spotify will bet the farm on maintaining its leadership position in the coming years – focusing on growth at the expense of profit. By doing so, reckons McCarthy, the company will take advantage of a little-known fact about streaming economics: the longer a person subscribes to a service like Spotify, the more profit can be coined off their custom. This, he says, combined with investments in the service and its scale, will fuel Spotify’s dominance over the likes of Apple and Amazon, while building an indomitable global business. Let’s begin with a basic reminder of the profile of the Spotify business. It’s a ten-year-old startup, but it’s a relative newcomer in the US – Spotify first launched here in 2011. It’s newer still in Latin America and APAC. All three regions have been and remain important drivers of growth. 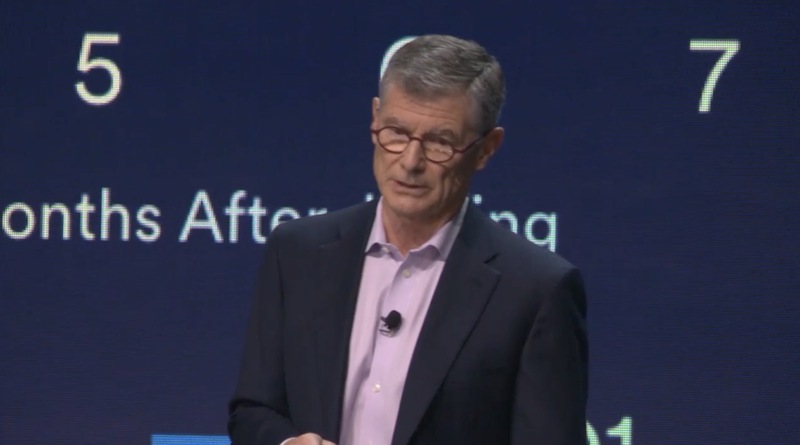 Growth, of course, has pressured our operating margins. You should expect us to continue to invest in growth at the expense of operating profit, because we believe that growth increases our enterprise value. And I’ll explain why in a few slides. Revenue has grown rapidly over the last five years as a result of investments we’ve made [by] launching in new markets – like Brazil, Mexico, Indonesia and Japan to name a few. [There’s been] new products like our mobile free tier which we launched in 2014; a better user experience is powered by machine learning and AI, plus our exclusive and personalized playlists, and new audio content like podcasts. 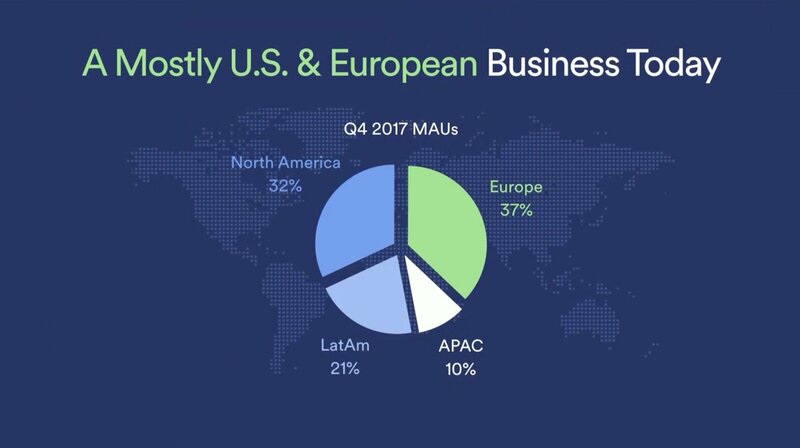 Gross margin has improved significantly with the growth of MAUs [Monthly Active Users] and revenue. In 2016 and 2017 we negotiated new agreements with our four largest label partners [Universal, Sony, Warner and Merlin]. The new rates improved our gross margin by about 700 basis points [7%] on a year-by-year basis. That wasn’t a magic trick – the labels were acting in their own self-interest to shore up Spotify’s economically-challenged margin structure, because of the growing importance of a healthy Spotify to the entire music industry ecosystem. In some respects, this reminds me of my first ten years at Netflix, when we transitioned from operating with a negative gross margin to operating with a 35% gross margin as the business scaled. The point here is that scale can be a great enabler of margin expansion, particularly if you couple it with greater data insights to drive a better user interface, add a better content experience, and in the process come to ‘own’ demand creation and the margin that comes with ‘owning’ demand creation. Becoming the world’s largest global music streaming subscription service has been expensive – costing more than a billion Euros in cumulative losses. 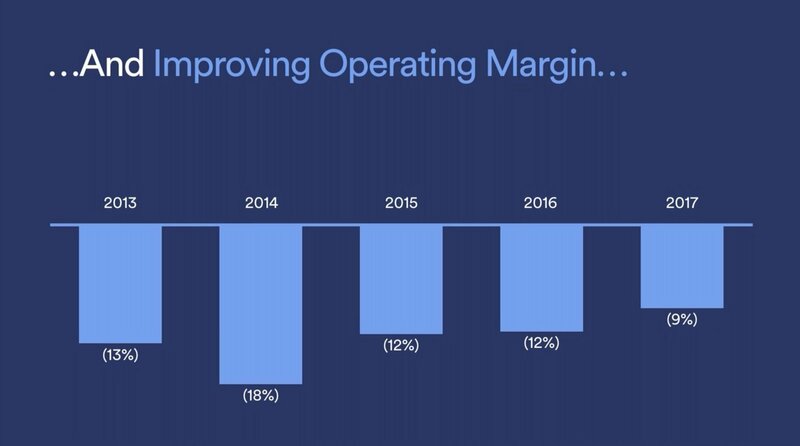 But the trend towards profitability is clearly apparent when you look at operating losses as a percent of revenue. 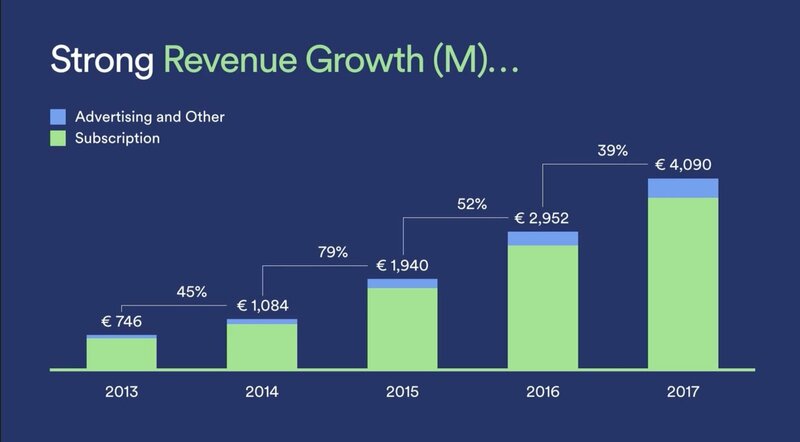 And keep in mind that’s in spite of the cost of launching in 45 markets since 2013, and in spite of our continuing investment in content and R&D to drive a better user experience, to drive faster growth. 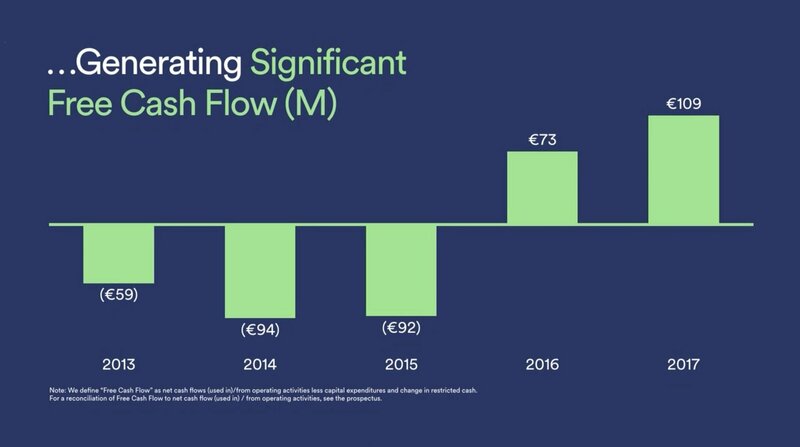 This trend in operating margin here explains the trend in free cash flow, which has been positive for the past two years, generating €182m in cumulative cash flow. 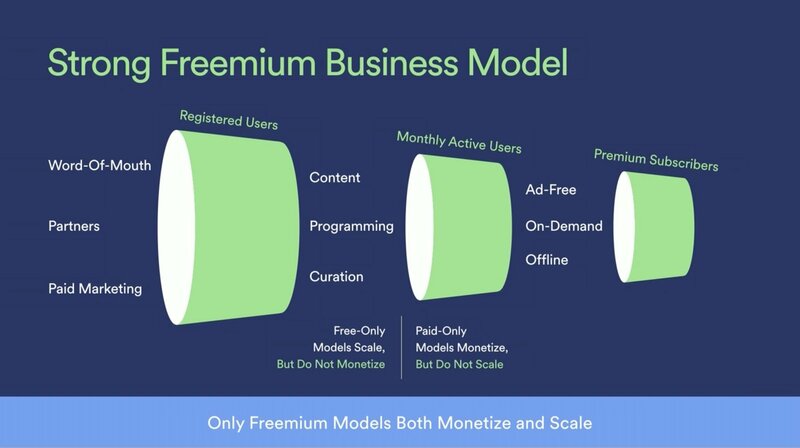 Our freemium model accounts for roughly 60% of our gross added premium subscribers. Some of you may know that I began working with Spotify as an investor and a board member. But it wasn’t until after I stepped into my operating role that I realized the effect of the freemium model on the overall economics of our business. The answer is yes and no. It took me a while to realize that the ad-supported business is also a subsidy program that offsets the cost of new subscriber acquisition. There are three ways to invest in growth: geographic expansion, marketing spend and developing a better user experience. The third of these three strategies produces, by far, the most viral effect and impact. That’s why the key to success in this business begins and ends with the user experience. On the [below] slide, you can see how the tech and dev investments we’ve made to improve the user experience have increased engagement. The number of hours of content consumed per MAU has increased by more than 30% since 2015, because the user experience is better. Why do we care about engagement so much? Because engagement drives conversion from free consumption to paid subscription. If you remain engaged with the Spotify service then, over time, more than one in every two free users will become a paying subscriber. Now, given our success with conversion, you may be surprised to learn that most free users [who] drop off the service over time [do so] because it doesn’t meet their expectations. That’s why we’re constantly working to improve the user experience. Now, once a free user converts, it takes us an average of 12 months to recoup the cost of acquiring that subscriber. The longer they stay, the greater their lifetime value to Spotify. 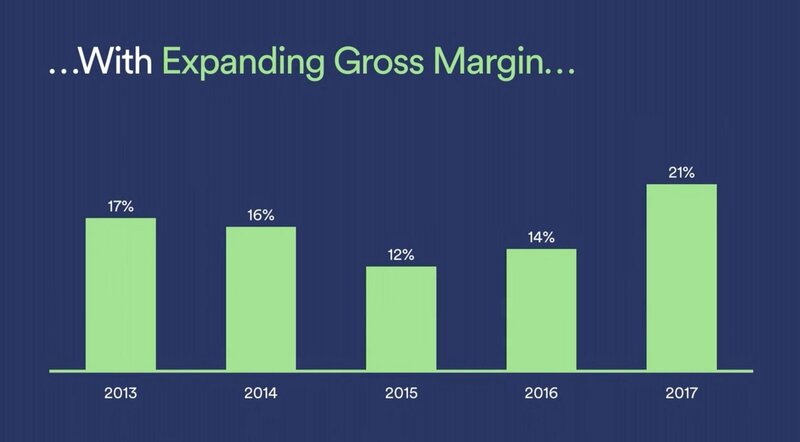 In this [below] chart, you see the cumulative lifetime value measured in green, and the net present value of monthly gross profit measured in blue – based on our Q4 premium ARPU [Average Revenue Per User] and consolidated gross margins. The longer they stay, the more profitable they become. This second point has profound implications for the profitability and predictability of the Spotify business as it matures. It also has important implications for competitive advantage, which I’ll discuss shortly. The primary driver of lifetime value at Spotify is churn. And the primary driver of churn is customer satisfaction. That’s why our R&D and content teams are so heavily invested in improving the user experience. The larger the subs base gets, the more operating leverage there is from extracting small improvements in the slope of the churn curve. 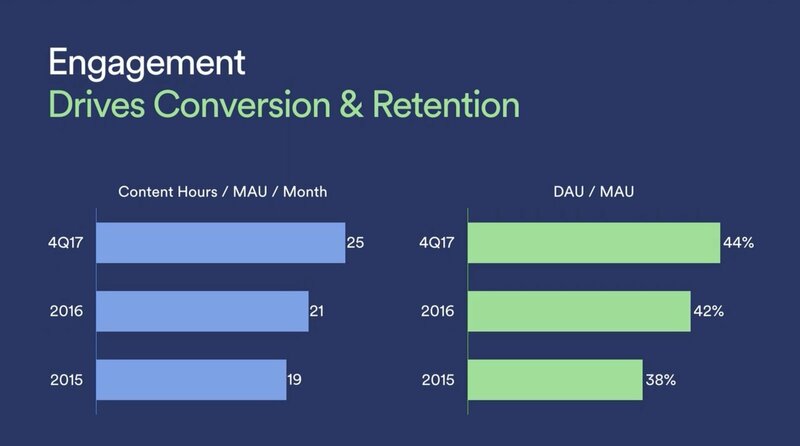 You can see from the [below] slide that we’re seeing small, steady improvements in churn over time. 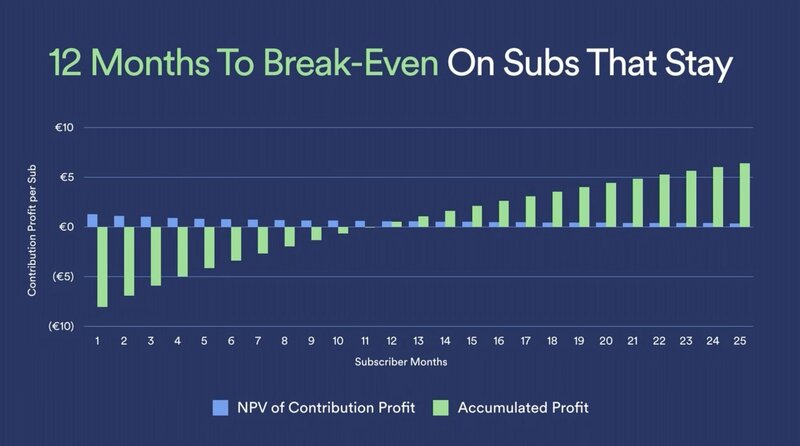 This slide also shows us that over the life of an individual subscriber, churn declines. 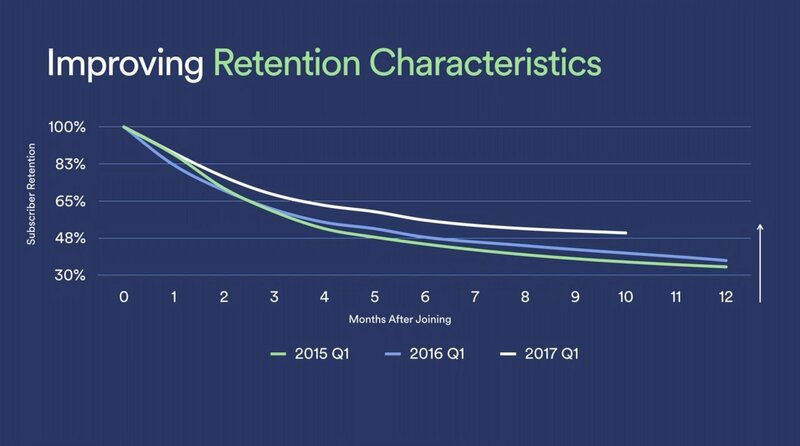 And that means that, as the average tenure of the Spotify subscriber base increases, the average churn rate falls. 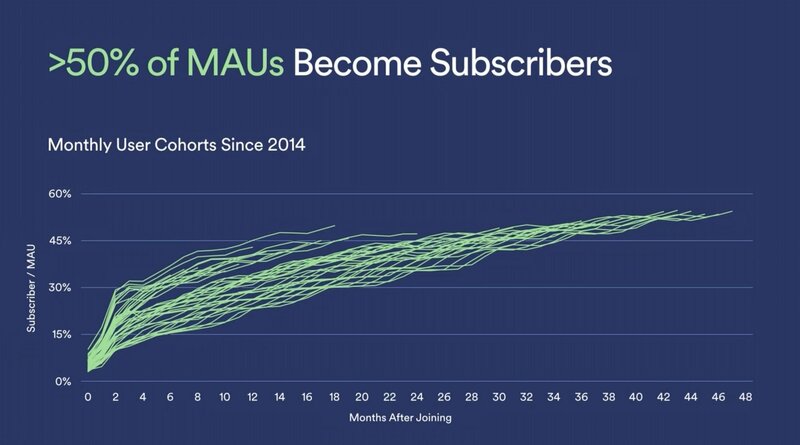 So… if you and I both run competing subscription businesses, and yours is older than mine, then even if our services are equally liked, with exactly the same churn curves by customer cohort, your average churn rate will be lower than my average churn rate. 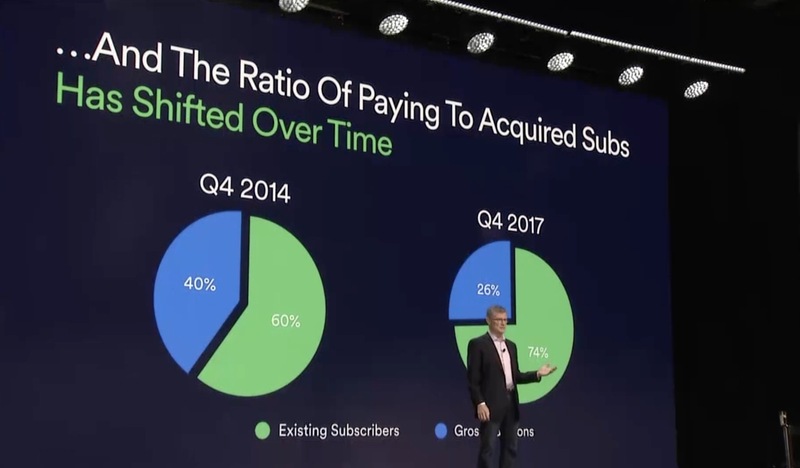 Which means that more of your marketing dollars are going to support new subscriber growth, and more of my marketing dollars are going to replace churned subs. Which means you can grow faster than I can and beat me like a drum. And that is a really good example of why scale matters. 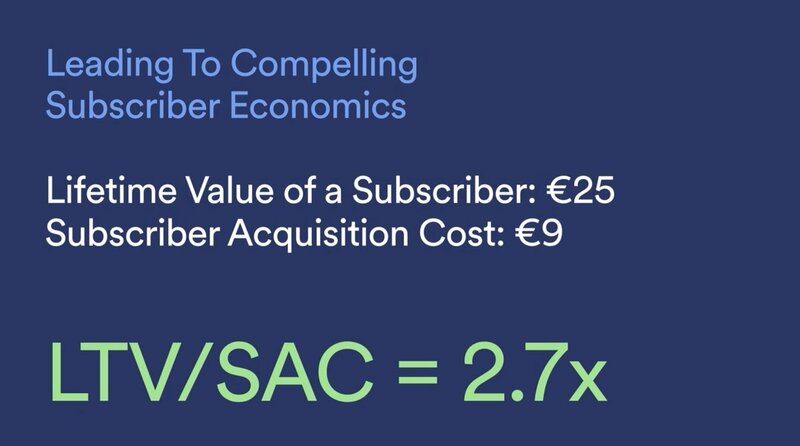 The acid test for whether our business model is working is the LTV [Lifetime Value of a subscriber] to SAC [Subscriber Acquisition Cost] ratio. It was 2.7-to-1 in Q4 of 2017. As long as this ratio is positive, we increase our enterprise value* each time we add a new subscriber, even though we lose money on each new subscriber when they first join the service. And this is one of the reasons you should expect us to continue to invest in growth at the expense of operating profit. After LTV-to-SAC, the next biggest driver of margin expansion over time is the ratio of newly-acquired subs to legacy subs or recurring revenue. We pay to acquire the new subs. But the recurring revenue is free from a marketing perspective. Over time, the ratio of free to paid shifts increasingly towards paid, which drives down marketing expense as a percent of revenue. This was the second largest driver of margin expansion during my 12 years at Netflix, when marketing expense fell from 24% of revenue to 14% of revenue. Here’s another example of scale: if your business is more mature than mine, then you’re likely to have more recurring revenue than I do. Which means you can use your higher margins to drive faster growth, to sustain your leadership position. And it also probably means that your installed base is larger than mine. Which means you’ve got more subs telling friends about your service. Which means you’ve got more free organic growth than I do. Which means your overall subscriber acquisition cost – a combination of ‘free organic’ plus ‘paid’ growth – is probably lower than mine. So not only can you beat me like a drum, but your drum sticks cost less than mine. So, where does that leave us in terms of goals for our business? 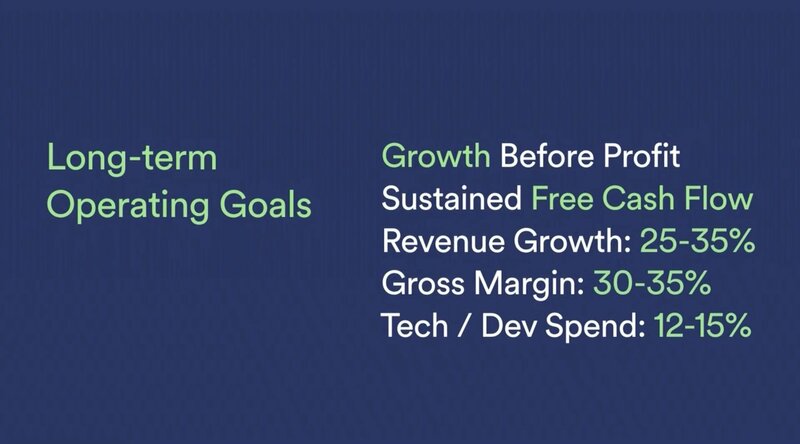 Between growth and profit, you should expect us to manage for growth. Because scale drives the sustainable competitive and economic advantages I spoke about earlier. Between operating losses and free cash flow, you should expect the business to continue to generate positive cash flow (ex-non-recurring items, like the build-out of our US headquarters in 2018). If the investments we made in content and R&D improve the overall user experience, and if – as a result of building our two-sided marketplace – we come to own discovery and demand creation for users and artists, then we expect the long-term margin structure of the business to evolve along the lines summarised above.